Hello everybody! 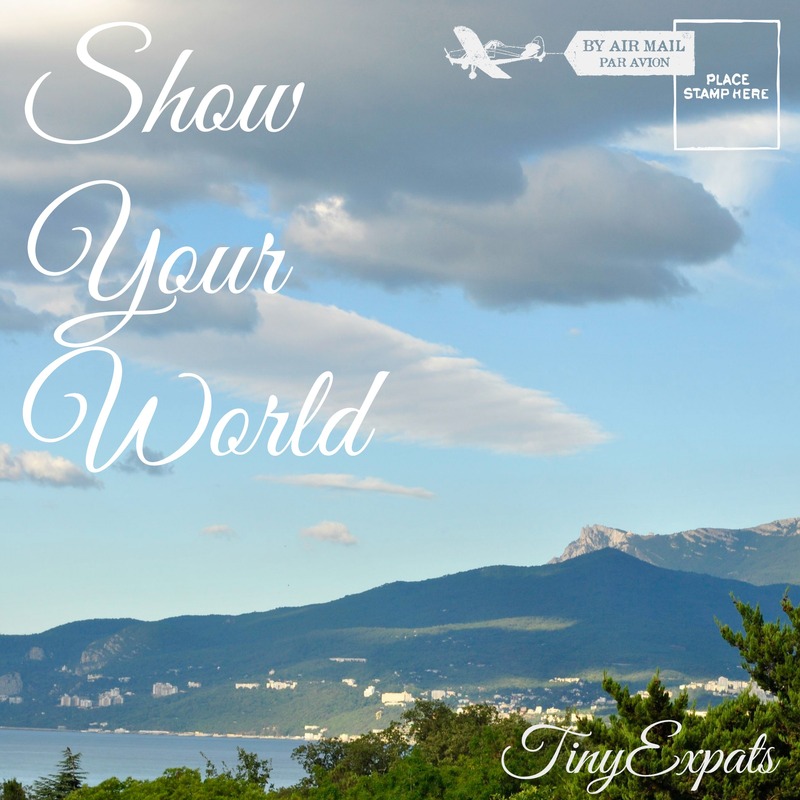 I’d like to invite you to participate in my Show Your World again and tell us all about your favourite corners of the Earth! Let’s make the entries pretty short – up to 300 words, but I won’t be very strict about it. Photos are welcome, but not a must. I will publish my own story every Saturday and everybody’s welcome to either place a ping back to this post or share your link in a comment below. I would collect these links from Saturday until Wednesday evening (I decided to extend the time limit a little, so you won’t have to rush), let’s say 8pm CET, and then post a round up on Thursday, sharing all the links and short descriptions of submitted stories. I will also share the links and images on my Twitter, Instagram and Facebook. Please, let me know your social network names, so I can tag you. Make sure that you add ShowYourWorld tag to your entries, so that others can easily find you. This week is a festival in Russia, Maslenitsa. 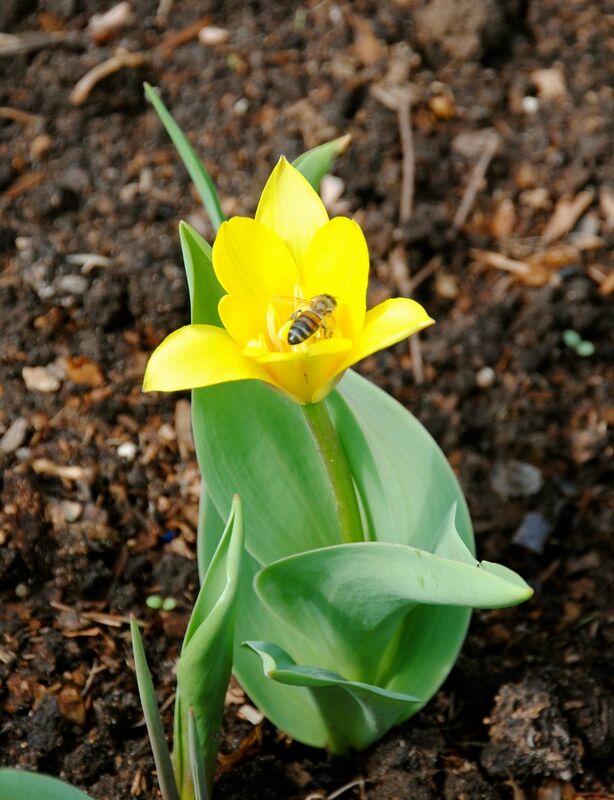 It means saying goodbye to winter, welcoming spring and celebrating the last week before the Great Lent for Orthodox Christians. I just wrote about it here. 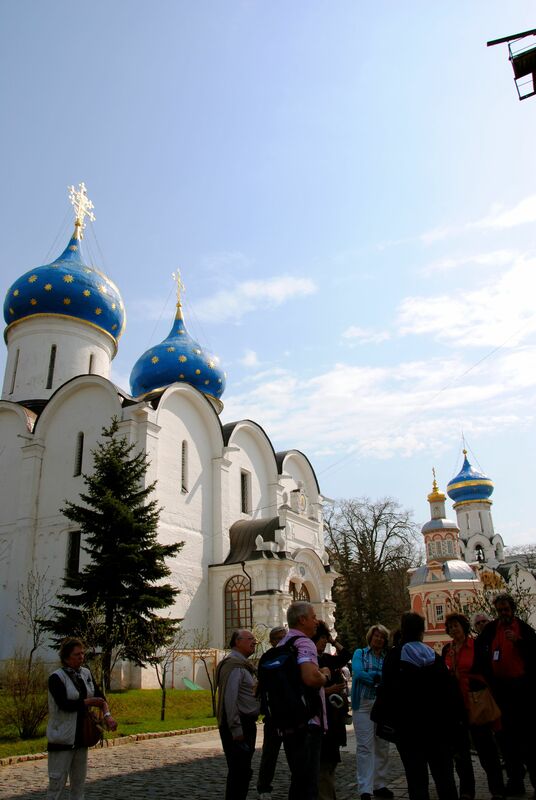 Therefore, I decided to take you to Russia, to one of the most important places for Russian Orthodox Christians – Trinity Lavra of St. Sergius, a monastery founded in the 14th century by one of the most venerated Russian saints Sergius of Radonezh. 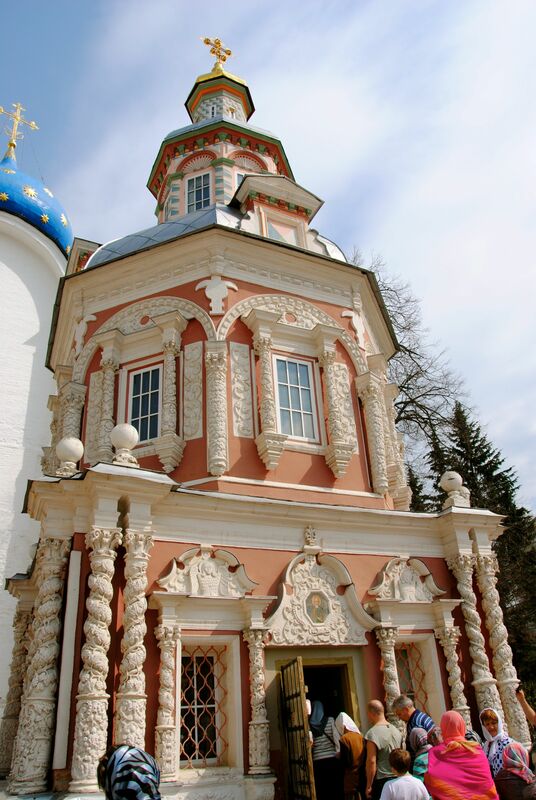 It is located in Sergiev Posad, a small town nearby Moscow. It was the last day of April and the spring was already claiming it’s rights by warming everything up with that gentle sunshine, much warmer than in winter, but not so scorching as it would get in summer. The sky was painted the special shade of blue that happens only at this time of the year and the air had the particular smell, which cannot be described but is known to anyone – winter is no more. We drove through the narrow streets of a provincial town – low buildings with old paint peeling off, small shops, unattended front gardens. Coming closer to Lavra the traffic got busier with tourist buses. 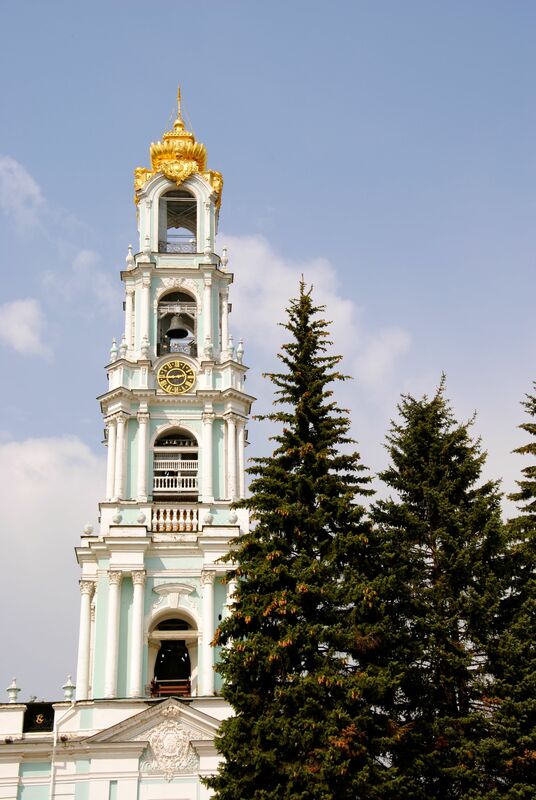 You can’t see much of it from outside – high white walls hiding the most of it, leaving only the golden domes raising above them and this view cannot prepare you to what you will see after walking through the entry tunnel. 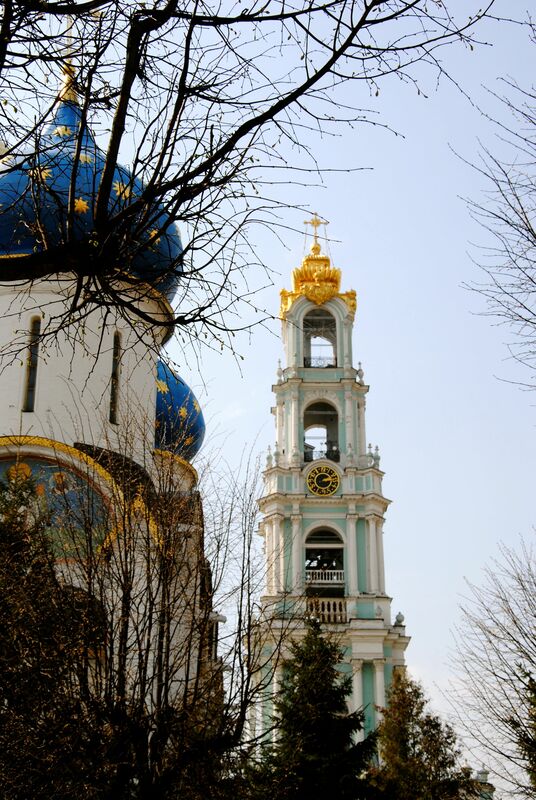 Built throughout the centuries, various churches and cathedrals brighten up the peaceful enclosed space of the monastery. White, red and blue topped with golden, shining in the sun, framed by old trees with new emerald leaves. Large groups of tourists, speaking in any language imaginable, contrast with quiet cloaked figures of the monks. Walking along the sunlit pathways, you can feel the history seeping through the cobbles. 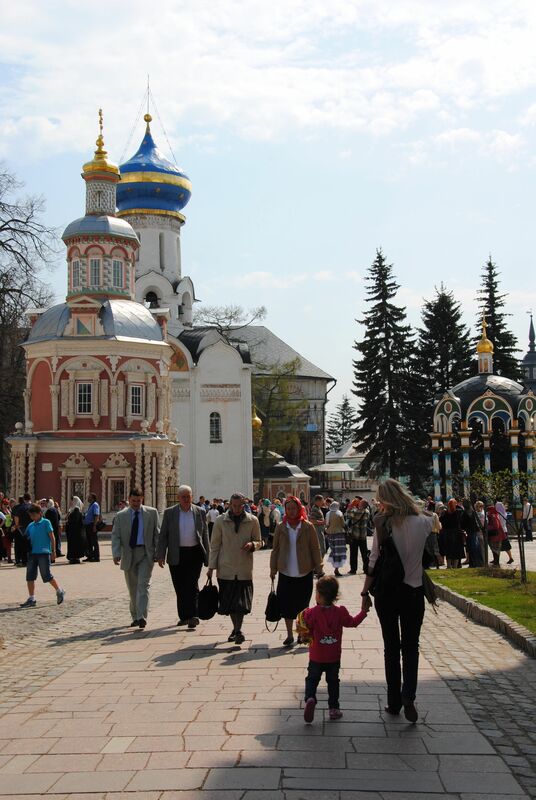 It’s a place for peace and contemplation, but it feels like a place to celebrate life, where ancient sacred walls of churches, adorned with icons painted by Rublev, are surrounded by fresh spring flowers, a couple of days old. I love the pattern of the building in the second picture! Yes, they were all so beautiful there! Very nice pictures. Funny also to see the blue flowers. 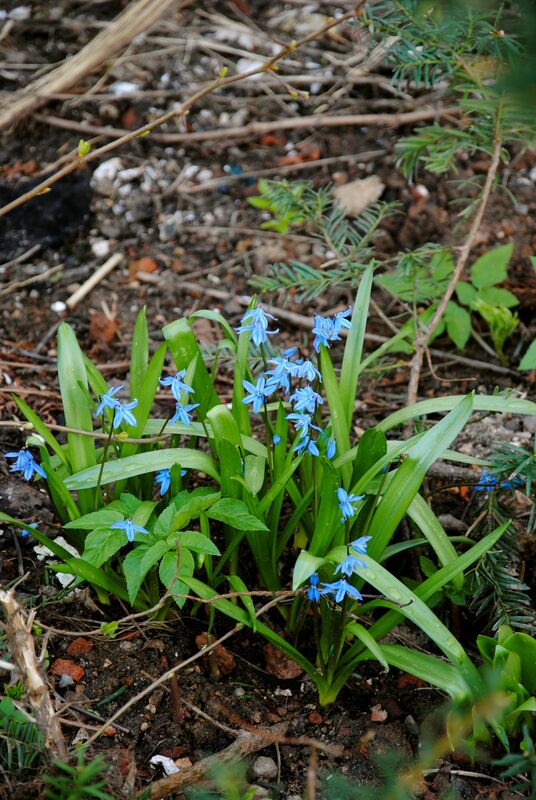 We had them in my childhood’s garden and my mother called them scilla. 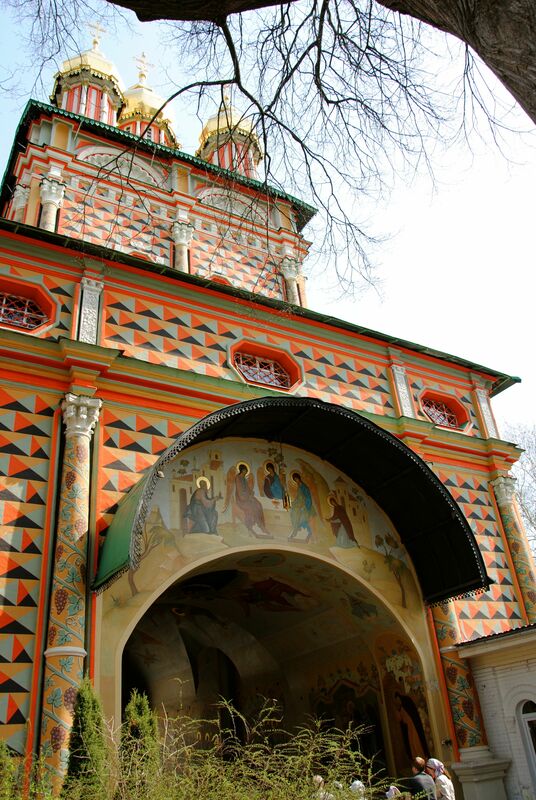 Churches somewhat like the ones here I have seen in Novgorod once I was there. In Copenhagen we have a Russian Orthodox Church, because the former Zarina Maria Federovna ( in Danish Dagmar) came back to Denmark in 1919 I think as a refugee and this Church was built for her. How interesting! Just recently I was reading up on Romanov family and realised that she was Danish (I thought that all of the brides were German) and now you mention this :) It’s a shame though that she came back alone, not being able to take her family with her.. Her sister was a much beloved queen in England called Alex. They were very alike and very beautiful. She did a lot of charity in England. Her husband king Edward was a son of queen Victoria. Their father the Danish king Christian IX. History has some very cruel turns, unfortunately.